Members save 50% off a selection of products including Tefal's Ingenio cookware range, perfect for caravans and any kitchen area with limited space. 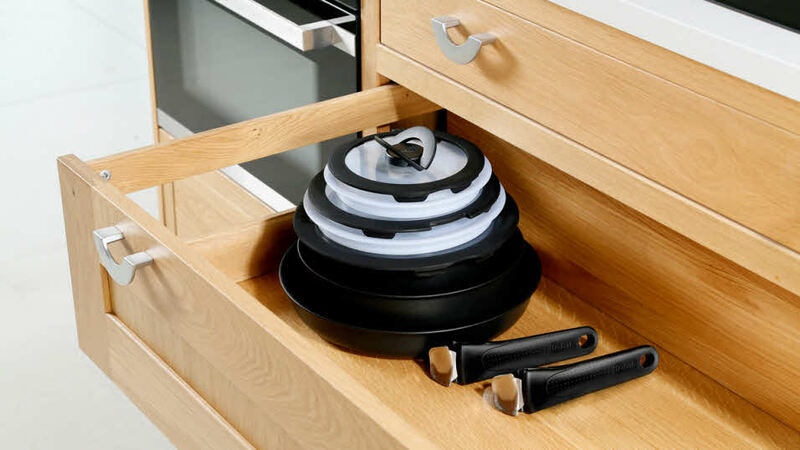 The simple, versatile cookware has a unique detachable handle for the ultimate hob-oven-table-storage functionality and optimal space saving for ultimate versatility, enabling you to cook it, bake it, serve it or store it and of course optimal space saving for ultimate versatility, enabling you to cook it, bake it, serve it or store it and of course optimal space saving. Use your cookware as pans, oven trays and even serving/storage dishes. Move from hob to oven to table in seconds. Pop the pan on the table for serving and detatch the handle. Use one of the plastic lids to freeze or refrigerate for another day. No need to worry about the weight the handle can bear either – it can safely hold up to 10kg. Thanks to the detachable handle, you can also neatly nest each pan inside one another, saving up to 50% of cupboard space. Offer only available to members of the Caravan and Motorhome Club. Offer expires 31 December 2019. For Customer Service enquires please visit the Home and Cook by Tefal website or call 0345 148 9101.